Join us for a night of a film under the stars as we partner with Rooftop Cinema Club and celebrate the release of our fourth issue of Time Out Los Angeles magazine. We'll be screening the surf documentary The Endless Summer, which is featured in the latest issue of our magazine. 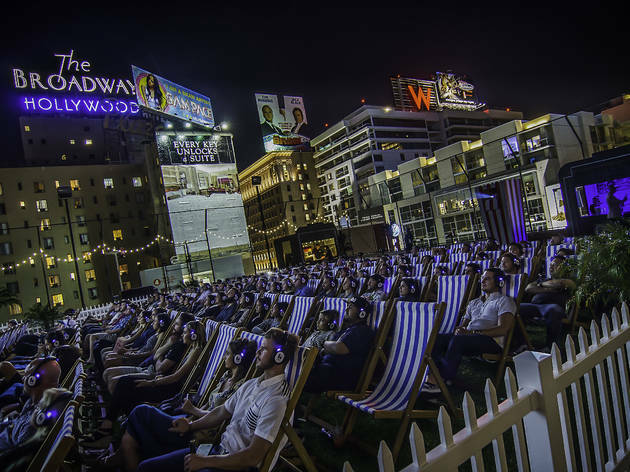 Take your experience up a level and head to the rooftop for a cinematic event like no other. Lean back and breathe in those city views from your comfy deckchair, and enjoy a pair of paloma cocktails compliments of Jose Cuervo Tradicional. The Montalban Rooftop opens at 7:30 pm for guests to purchase food and additional drinks, as well as to enjoy stunning views of the Hollywood landscape—including an unmissable sunset. While headphones are provided for every guest, please note that blankets are available on a first-come, first-served basis. Rooftop Love Seats can only be bought in pairs (seat width 33”). Doors open at 7:30 pm, film starts at 8:30 pm. Seating is first-come, first-served. – Parking is available next door in the garage for a $10 flate rate. 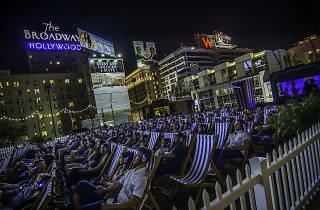 The Rooftop cinema showings are always a good time. Great view, comfy chairs, blankets and headphones. The candy and the free drinks were certainly a welcome touch. The weather made for a lovely night and it was definitely a nice relaxing Monday evening.